Usually, the most up-to-date version of this documentation, and the translations to many languages, are located here: https://kitserver.mapote.com. Documentation for Kitservers 5-8 and Kitserver 2010/11 can also be found there. 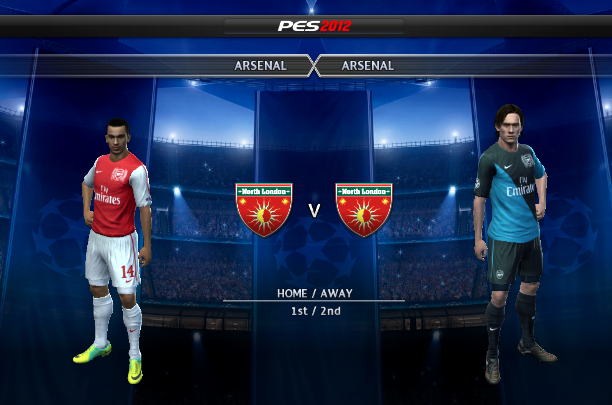 Kitserver 12 is an add-on program for Pro Evolution Soccer 2012 and Pro Evolution Soccer 2012 Demo/Demo2. It is a loader and manager for various modules, where each module is built as a (typically) independent DLL containing logic to enhance the game in particular aspect. While originally the Kitserver was developed to "serve" kits for Pro Evolution Soccer 3, a lot more functionality has been added over the years. 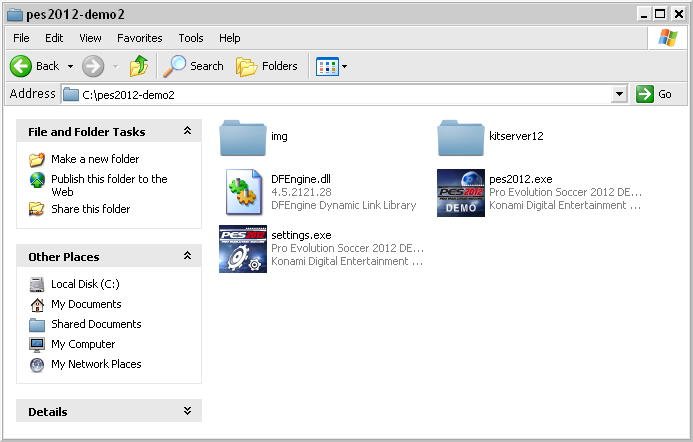 Because of the nature of work that Kitserver does, it is advised that you install PES into a non-system folder. Instead of putting it into C:\Program Files\KONAMI\Pro Evolution Soccer (default location on XP), use a folder that you have full ownership and control over. For example, C:\Games\PES2012, or something like that. New Windows versions have hidden logic related to system folders like "Program Files", so it is best to avoid them and save yourself plenty of time and hair. Unpack the archive (kitserver-12.x.x.zip) into some temporary folder. 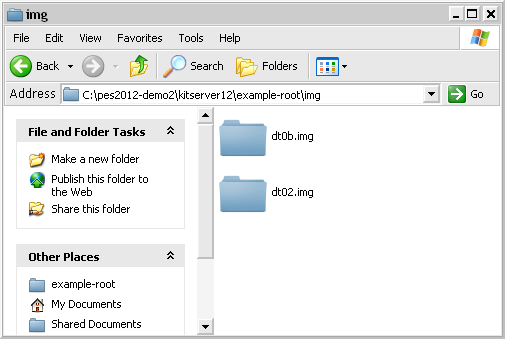 You will see a folder called kitserver12. Copy this entire folder into your game main folder, so it looks like the picture below. That is it, you are done. Uninstall is very easy: just delete the kitserver12 folder, when you no longer need it. Kitserver doesn't write into system folders, or anything of that sort, so removal is very simple. In order for Kitserver features to work in the game, you need to "attach" the Kitserver to your game main executable (typically called pes2012.exe). To do that, go to kitserver12 folder, and run manager.exe. If you placed the files correctly during installation steps, then you will see manager showing you the list of game executables that you can Attach/Detach kitserver to. Click [Attach] button, and wait for the manager to confirm that the attachment was successful. Now go one level up in the folder hierarchy and double-click on the game exe (to which you just attached the kitserver) and the game should start. Note that you do not need to attach the kitserver every time you start the game - you only need to do it once. Once attached, it stays that way, until you detach it. You can always run the game without Kitserver. To do so, you will need to Detach the kitserver from the game exe. (You can always re-attach later again). Run manager.exe, select the correct exe, and click [Detach] button. Wait for the manager to confirm that it had successfully detached kitserver. Now run the game exe, and Kitserver will no longer be loaded. The order of the roots is significant, when it comes to resolving "collisions". Say, you have a dt0b.img/ball_11.bin in the second root (example-root), and dt0b.img/superball_11.bin in the third root (patch-RPL). Even though the files are actually named differently, they intend to replace the same BIN - #11 from dt0b.img, and therefore we have a "collision". The rule is simple: the lower root in the list wins. Which means that in this situation, the dt0b.img/superball_11.bin file will be used, since its root is listed last in the [afs2fs] section. 22, "I'm mad about you", "Sting"
23, "Вне зоны доступа", "Город 312"
The GDB contains a folder named uni, which is responsible for storing the team kits (uniforms). The single most important file inside uni is called map.txt. This file tells kitserver where to find the kits for particular team. As you know, each team has a unique id - an integer in the range from 1 to 65535, although in practice there are only about 500 teams potentially available in the game. PLEASE NOTE that this year the mapping is slightly different: GDB now uses team IDs instead of team positions (indices) in EDIT.bin data, as was done in previous years. This may initially be somewhat confusing to people who got used to GDB using different numbers to refer to teams. But long term, i believe, this will actually simplify things a lot: team IDs are already used by other editing tools, so it makes sense for the GDB to refer to the teams by also using the same IDs. Just run the game once with kserv module installed, and it will create a file called "teamlist.txt" in kitserver folder, which will contain IDs for all teams in your game. IMPORTANT: Double quotes are not required, but advised - just so that there is no ambiguity about folder name. You can see from map.txt above that in order to find a kit for team #101, the kitserver needs to go to the folder GDB\uni\EPL\Arsenal. This folder will contain all of the kits that are available to team #101. Inside it, you must create an individual folder for each kit. 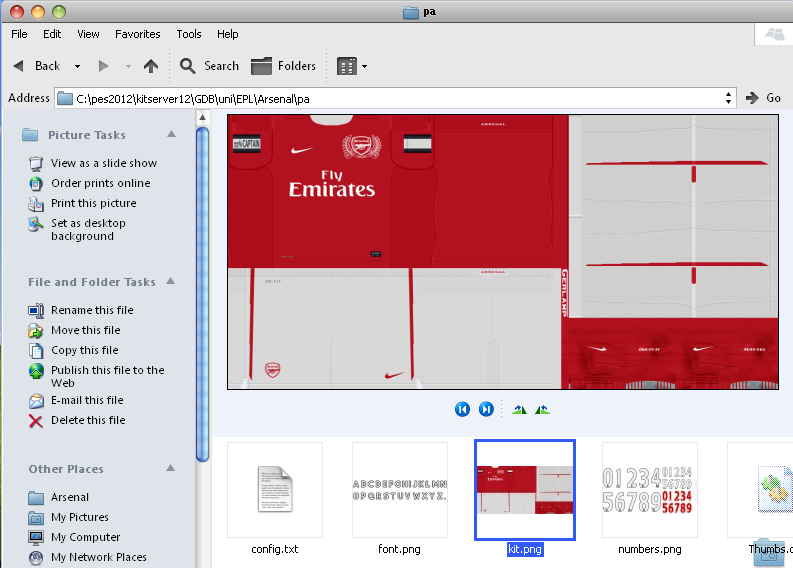 Like this: For players, 1st kit must have a folder name pa, 2nd - pb. Extra kits can have any folder names that start with letter "p". I found it useful to prefix all extra kits with px-. For example, px-redwhite.--> For the goalkeepers, 1st kit must be in the folder ga, 2nd - in the gb. Extra kits can have any folder names that start with letter "g". Please note, that currently (as of kserv 12.1.0) extra kits for players and goalkeepers are not yet supported. I may implement them in the future releases. A team may also have an alternative set of kits, which are only used in European club competitions, such as UEFA Champions League and UEFA Europa League. 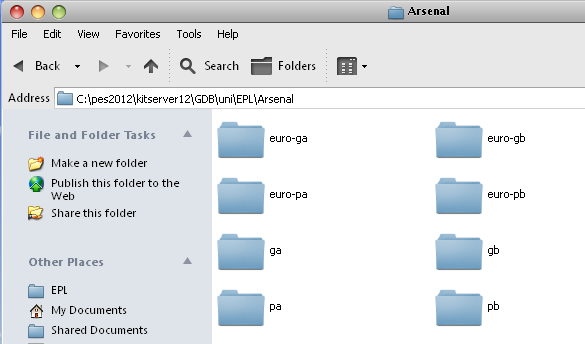 Put those kits into folders named: euro-ga, euro-gb, euro-pa, and euro-pb respectively. These kits are optional, however. If a team folder does not have euro-* kits, then the regular ones (ga, gb, pa, pb) will be used instead in European matches. If you have faceserver enabled (which it is by default), just start the game, and then in the kitserver12 folder, there should appear a text file called playerlist.txt. It will contain the IDs for all the players that you have in your game, sorted alphabetically for easy searching, including the user-defined players that were created from scratch in Edit mode (those typically take IDs starting from 1048576). Faceserver should work fine in all online modes, although i have not done a lot of testing with it. 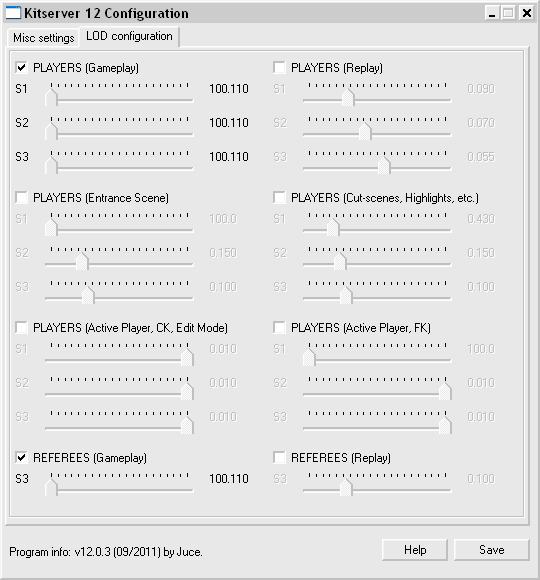 LOD-Mixer is the module that allows to fine-tune some aspects of PES 2012 graphics engine. Unfortunately, PES series had always suffered from an overly- conservative LOD configuration, where the switch to low-poly models would happen way too soon, and that would result in various visible artifacts. In PES4-PES6, examples were: balding players, and missing details on kits. 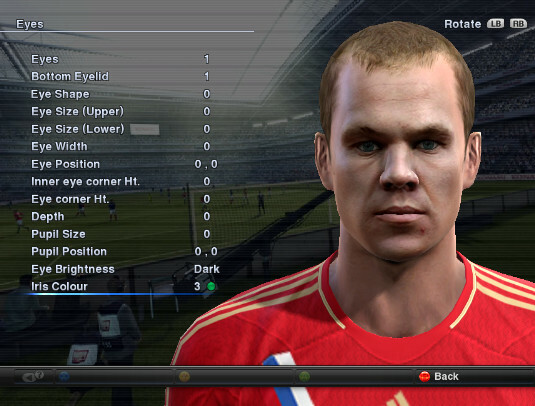 In PES2008-PES2012, the players and referees appear to have blurred generic faces, once they move slightly away from the camera. 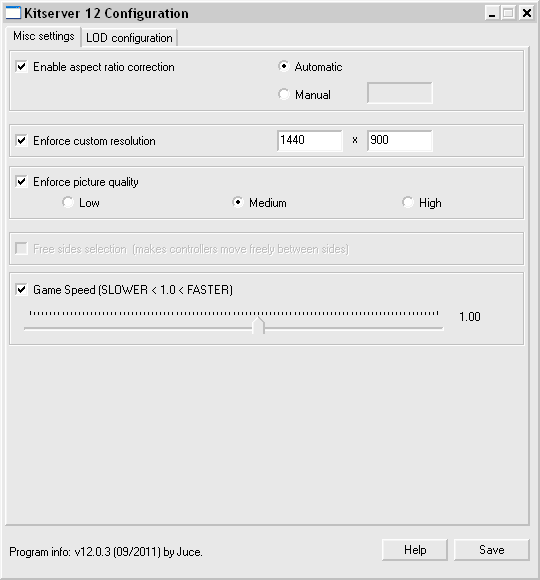 Now, coming back to our game, as i said, in many cases, you only really need to adjust 1 slider or two to get the desired effect, and still keep the smooth frame-rate.